Locations of about 80 m2 in grass; facing south; view on the village and the valley; possibility to have electricity; Access by car, bike or motorcycle; Sanitary free to access and close; unlimited access to the trampoline, table tennis and boccia; mini golf and restaurant 'Le Trappeur' on site. Real chalet; all wood; private terrace; view over the valley; southern exposure; 35 m2; 2 bedrooms: one with double bed and one with bunk beds; possibility fifth bed; living room / kitchen; bathroom with toilet, fully equipped and furnished; TV , wifi; possibility rent sheets and pillow shams; authentic mountain ambiance! Unusual lodging / gite: tipi entirely in wood, on 2 levels, with all comfort, 3/4 beds possible, bathroom and shower. A haven of calm in the middle of nature: the assurance of being able to rest protected from any surprise weather! Terrace and outdoor garden equipment to enjoy the sun and nature. The real trapper tent, with more comfort and on stilts! Wooden structure (floor and walls) and double-roof waterproof canvas: the assurance of being safe from unexpected weather surprises. A room with two single beds, sanitary nearby. Sheltered terrace and magnificent views of the village and the valley! Perfect compromise between camping and cottage, we love it! Real chalet; all wood; two terraces ; view over the valley; southern exposure; 40 m2 and mezzanine; a bedroom with double bed, kitchen, living room with two sofa-beds and mezzanine three beds, bathroom and WC, fully equipped and furnished, TV and dishwasher; possibility rent sheets and pillow shams; authentic mountain ambiance! Inde pendent room in a wooden hut ; maximum 2 people; beds and electricity ; ideal for hikers, cyclists and motorcyclists ; a real authentic refuge ! 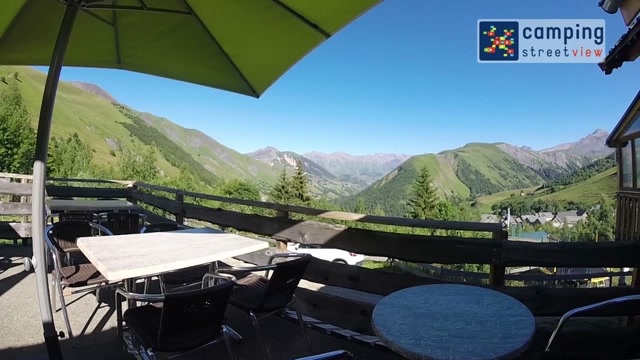 Locations of about 80m2 in grass; facing south; view on the village and the valley; possibility to have electricity; Sanitary free to access and close; unlimited access to the trampoline, table tennis and boccia; mini golf and restaurant 'Le Trappeur' on site. Delightful night or weekend? Unusual and exotic, charm and comfort. Trailer fully fitted and equipped with bathrooms. View over the valley and the village! A 2-room wooden hut for one or more days with double bed room, equipped for 2 rest and enjoy warm and comfortable accommodation. Still an unforgettable view, a simple and warm pleasure! The authenticity of the campsite but with comfort, mixed wood and canvas! on a wooden platform, wood walls and roof lined waterproof canvas, 2 bedrooms, 1 kitchen / living room, wooden terrace, you will live an exotic holiday without weather risks. The equipment consists of beds with duvets and pillows, small furniture and for the kitchen area: microwave, fridge, electric hob, toaster, kettle and coffee maker. WiFi strong in breakfast/dining area, weak in cabin. Fantastic location with lots of good memories. Having to leave when our stay was over. Snug and comfortable whatever the weather outside, plenty of hot water. Cold shower on one occasion although site was very busy as stay was during the Tour de France. Fantastic location for cycling/walking holiday. Food very nice in the on site restaurant. Chalet too small. Basically a wooden tent. Previously stayed at site in canvas safari tent which was much more comfortable and better equipped. Comfy bed, although oddly placed. le calme , la sérénité de l'endroit .le concept roulotte était génial !!! un accueil formidable et un restauration au top ! merci a Annick et Olivier . 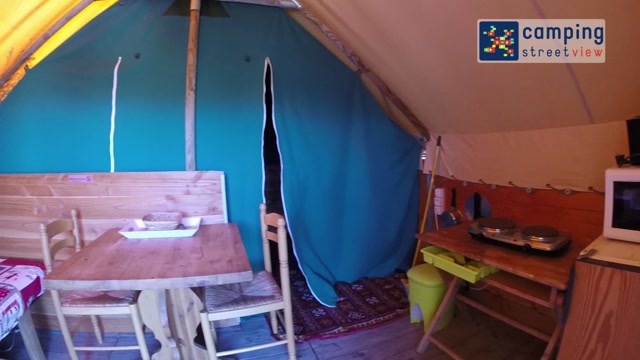 prochain week end c'est le tipi !!! L'ÉQUIPE, l'accueil, l'amabilité, la situation. La mise à disposition des jeux pour enfants. disponibilité du patron et du personnel, emplacement idéal pour une étape du Tour de France.